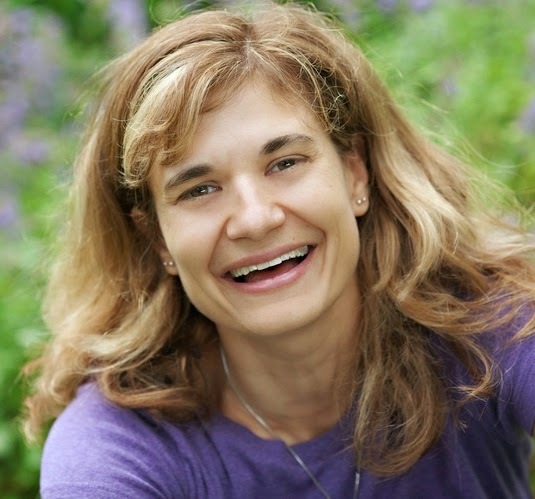 Kimberly Sabatini is the author of the moving young adult novel Touching The Surface, which tells the story of a teenager named Elliot, who finds herself landing in the afterlife again and again. The book’s vision of the hereafter is as much about delving into one’s personal past as it is about the paranormal, and the story takes readers on an intriguing and lyrical journey. In this post, Kimberly will share with us the more high-profile aspects of the writer’s craft: the secrets to doing author visits. You seem gratified by your appearances in various settings. Please tell us about your approach to doing author school visits and the role technology plays. KS: It helps that as a former teacher, I feel pretty comfortable getting up and talking in front of students. I have a tendency to tweak my presentations to my audience, so I tend to adjust depending on how they are reacting to me. Technology helped me to do my first Skype visit with a book club. Loved it. It was wonderful until my cat jumped on the desk and started to throw up in front of everyone. True story. I may have tossed her GENTLY over my shoulder. Kitties love to be the center of attention! What's something unexpected that can happen while you are presenting? KS: The cat wasn’t enough for you? Okay—I had one of those teachery wheeled crates to carry some of my very heavy props and books with me and as I was wheeling into the school, the bottom fell out. I kind of rigged it back together, but I was leaving a trail of bookish things like Hansel and Gretel. 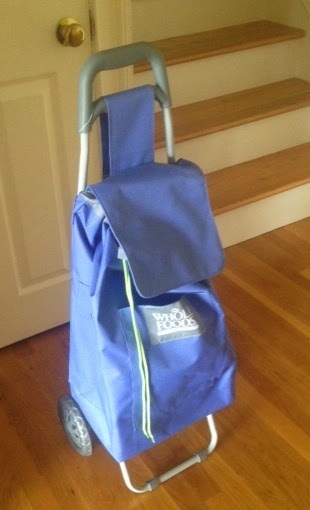 My newest find is a large wheeled grocery cart from Whole Foods. How are library events different from school visits? KS: With a school visit there is a built-in audience guaranteed to be there—classrooms or auditoriums full of students. Library events can be equally as packed, but it isn’t a guarantee. I once drove over an hour in the rain to a library event for two kids—but they were really awesome kids! Also a library visit may have more of a range of interested readers and writers—kids through adults. This can make for a lovely, diverse audience. I tend to be about making connections more than selling books, but if you can do both—SCORE! What kinds of questions do participants usually ask, and what topic does Touching The Surface often bring to the surface? KS: I find that most people want to understand what is going on behind the mysterious curtain of publishing. I’m usually asked about my writing process and how I get my ideas and battle writer’s block. The things that I love to add to my talks are the personal stories. People connect with honesty and humor. 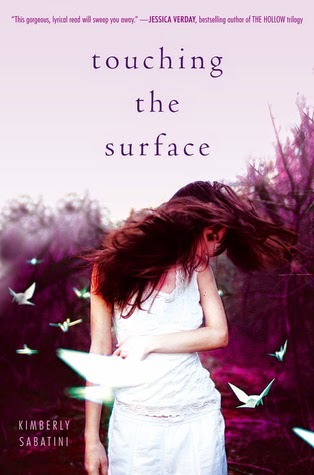 As for Touching The Surface, the book talks about teenagers who have died. A lot of kids are slow to talk about such a deep topic, but when they finally open up, it’s easy to see how smart and emotionally complicated YA readers are. What’s the greatest challenge to doing a book festival? KS: Being at a book festival that has your target audience. There is nothing worse than being at a festival with a YA book when all the patrons are looking for picture books. Or adult non-fiction. It just doesn’t feel good to be watching everyone else having fun, while you sit in the corner like a wallflower. But if you do find yourself in that situation—make friends and buy lots of picture books. Seriously, you’re never too old for a good picture book. What do you bring to make your table enticing? KS: I’m growing in this area. More published books would definitely do the trick. LOL! I have a couple of acrylic stands with some information about myself and my book. This way if I’m busy talking to someone, another book lover can find out about Touching The Surface. I have plenty of bookmarks and sharpies for signing and also origami paper cranes. It’s good to have something special you can hand to people that will allow them to contemplate your book after they have left the table. How do you approach signing books? KS: If I don’t have sticky notes for people to write down the name of the person they want the book signed to—I ask them to spell it out very slowly. I’m horrible at moving names from ear to paper. And there are so many different and unique spellings of names nowadays, I’m always scared I’m going to mess it up. 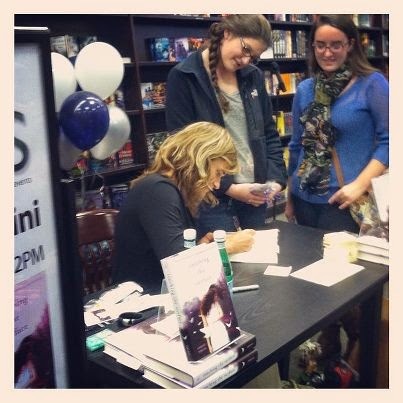 Signing a book for someone never gets old. I want to do it for the rest of my life. What kinds of messages have you been asked to inscribe in your books? KS: The YA novel I’m working on now has gone through some exploratory drafts and has changed quite a bit over time. It’s still very much in the “I can’t talk about it phase,” but I’m loving what is happening with it and hope to have it to my agent sooner rather than later. Please keep us posted with any updates. We can’t wait until your next book comes out. Thanks so much for such a fun and interesting discussion, Kimberly. All the best, Chris Brandon Whitaker! Hansel and Gretel... I can picture it, Kim ;-). Great interview!! Thanks, Joanne. I like the image of the trail of stuff falling from her wheelie, too! So stressful right before presenting! Kim, you always rock at book festivals -- I can feel your energy from wherever my table is! Great interview. Thanks, Jen! 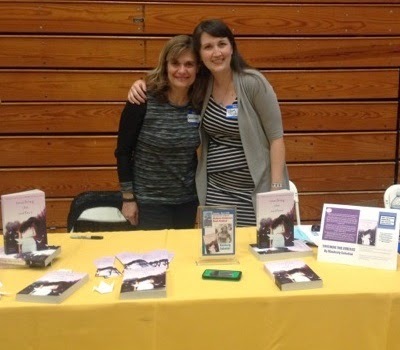 It was great seeing your smiling faces at the Hudson Children's Book Festival. Such a wealth of talent in this valley! What a fun interview! I could clearly visualize the bad kitty and broken cart. So looking forward to the next book!